These four letters were written by James B. Johnson (1843-18xx) who served in Co. D, 87th Ohio Infantry. He was mustered into the service in June 1862 for a term of only three months. The regiment left Ohio in mid-June for Baltimore and then were sent to Harpers Ferry in late July where the first letter was written at “Camp Banning” — named after Col. Henry Blackstone Banning, their regimental commander. The regiment was involved in a couple of minor skirmishes in September and were included among the troops surrendered at Harpers Ferry to Stonewall Jackson’s men just before the Battle of Antietam. They were paroled and sent to Annapolis before being mustered out of service on 20 September 1862. In 1863, we learn from the second letter that James worked for J. S. Stratton in Toledo, Ohio. From it we also learn that he began to entertain the idea of seeking a commission as an officer of colored troops. On 9 October 1864, he enlisted as a 2nd Lieutenant and on the same day was commissioned into Company G, U. S. Colored Troops 5th Infantry. He was promoted to 1st Lieutenant on 2 January 1865, on which day he was commissioned into the U.S. Colored Troops 117th Infantry. Johnson resigned on May 29 1865. The 5th U.S. Colored Infantry Regiment consisted of white officers and African-American regulars enlisted during the Civil War. Formed as the 127th Ohio Volunteer Infantry Regiment at Camp Delaware OH, it was redesignated as the 5th Regiment, U.S. 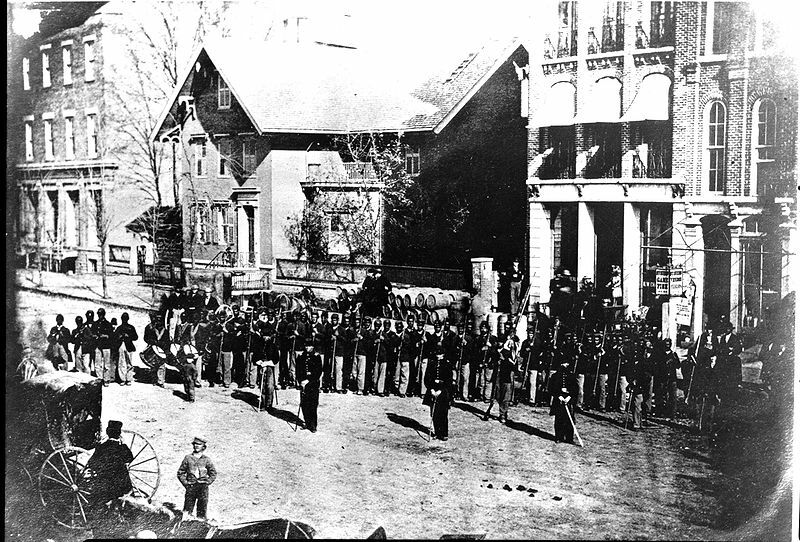 Colored Troops and moved to Norfolk, Virginia in November 1863. The unit saw considerable action North Carolina and Virginia during 1864. During Lieutenant Johnson’s service, the 5th fought at Fair Oaks, from Oct 27-28, before returning to the trenches near Richmond. In December 1864, the 5th was assigned to the newly formed XXV Corps, and participated in the failed attack on Fort Fisher NC from Dec 7-27 1864, and the successful Second Battle of Fort Fisher from Jan 7-15 1865 soon after Johnson was detached. Today I suppose the house is full and you are making yourself general useful and agreeable. I believe I should like to be there just today so as to go to the concern tonight to hear the singing of course. I don’t think now that the 87th will recruit quite so soon as I did. It don’t look much like it now at least. Most of the boys will join other regiments in which they have friends. Do you know whether there will be a chance to enlist after the 10th of September. We heard yesterday that Pope had whipped Jackson all out. We have been expecting an attack and have received reinforcements but since the news, I guess it has all blown over. Three companies have gone out on an expedition of some sort today but I don’t know what for. We shan’t go home tip loud time is out and perhaps not then. I am afraid I shan’t have a very good chance to enlist and I don’t want to study this fall for all the boys will be gone. I wrote to Miss Jenkins the other day and I don’t know but she thinks I am rather fast but I thought she sent me a program with remarks to the exercises. Pinny [?] is going to study again when he gets back to Oberlin but I don’t know what the Cap[tain] will do except [get] married which he will do as soon as he gets home. I have pretty good health all the time but don’t weigh as much as I did at home. Still I am stronger and can stand more than I could. I wrote to Edd two weeks ago for two dollars but he hasn’t written or it has been lost. If either, I wish you would send $2.00 by return of mail for I shall have to lose $2 unless I can pay in cash. I received yours of yesterday this morning. Am glad mother has gone west for I know she will enjoy it so well & almost wish I were in Edd’s place. I am getting to be of some use to Mr. Stratton ¹ (by the way his name is J. L., not H. D. Stratton as you have it) and begin to feel more contented though I would jump at the chance of a commission in a colored regiment. A. B. Johnson made me a visit and you know I couldn’t take him home with me so I went to the McKinster House and paid $1.50 for a meal. A. B. is the same as ever — has pretty high ideas of his capabilities &c. but I want to see him try it before I believe he can succeed in everything. Although he is a pretty smart scholar, I believe something else is needed to get along well in the world. I received a couple of notes against a Mr. Pendergast from Mr. Plumb but can’t find any traces of him at present. The townspeople got up quite an excitement yesterday on the report of a rebel invasion of Lucas County & several __ Tug loads and wagon loads started off to drive out the invaders. Haven’t heard much about it since they returned so I suppose it was all a farce. Probably some gypsy horse thieves. You may put my name down as a member of that substitute club & I will send you the money whatever it is. ¹ I believe this was Jerome L. Stratton (1838-19xx), a civil engineer in Toledo, Ohio. Jerome was married to Elizabeth Lawton in 1861. I received your letter some time since but have almost forgotten whether I have answered it or not. We are in the trenches again — that means in our shebangs behind the breastworks feeling very comfortable and perfectly safe so long as there is no move on our side. We had a little excitement this morn & made every preparation for an attack from the Johnnies on account of its being Election Day. This is proof enough to me of the style of loyalty of the McClellanites. We the officers of the 5th had a caucus last eve and made arrangements to vote and give all the “more than half white” a chance. It will be my first vote and I think I couldn’t christen it on a more important occasion for the coming election will have as much effect on the war as all our recent victories. We have just received an addition to our officers — two 2d Lieuts. from a Connecticut Regiment — both fine-looking fellows. Just was interrupted by an order detailing me as officer of the day and had to report to headquarters “without delay” where I received orders to have the companies march up one at a time commencing with A & deposit their votes. A good many pretty dark ones are voting but there is no one to challenge them. We are having rainy wet weather and I think the campaign is over for this season. But there is going to be a Colored Corps organized & they won’t probably be very choice of it when there is any fighting. We hear that Willie is getting better & will not probably lose his legs. I have just been up to see how the vote came out this eve. [James L.] Patton, [Elliott] Grabill & [Frank] Ford are judges. [Albert] Safford & [Frank] Call clerks. There were 194 votes polled — all for Lincoln. We had no McClellan votes. The McClellan voters were in sight of our polls looking on as if they were quite interested, but owing to an armed force around the polls, they didn’t seem it safe to use their right of suffrage. In fact, they did collect at a picket post in plain sight of where we were voting, exchanged papers, and were very anxious to learn how things were going. I received a letter from grandmother the other with some tracts enclosed. I think I wrote you something about sutler business. We have a permanent sutler now and so that is up. I should like to get some of you down here for company but shall have to give it up I guess. Have just been round visiting the guards. Got the guns away from half of them & came pretty near getting a hole punched through me from one guilty fellow. Shall go round again when the 3rd relief goes on and then go to sleep till 4 o’clock in the morning. [Rev. James] Patton is having a shebang built today — that is a square log pen with the open spaces chinked & plastered with mud with a hole cut for a door & one for a fireplace. Covered with shelter tents, they make very comfortable abodes. Camp of 5th U. S. C. T.
I received your letter just now. I suppose you have received my letter with regard to sutlership. I am sorry, but will keep a bright lookout for another chance. Was very glad of those p[ostage] stamps, as we have no way of getting them here, except by sending. We are back from the works 100 yards or so, drilling, doing fatigue & picket duty & “nesting” but will be glad to get back into the trenches, where we have nice warm houses built and no drill. Mr. [James] Patton gave us his first sermon yesterday, which was very short, consequently acceptable, as it was a very cold day and came between Inspection & Review. We had a little flurry of snow — the first of the season with us. My first Lieut. & I have 4 blankets & so manage to keep very comfortably by laying close. My greatest trouble is in keeping clean. Water is so very scarce & it is hard work to leave camp. Father said he would send me things by express whenever I wanted them & I am inclined to take him up. Call & I are in want of some little things & we thought you might send both in one package. I want about 10 quires of note paper & envelopes., a pocket inkstand, a silk handkerchief, a house wife [sewing kit], a testament, a little blank book & a 30 ft. tape measure, graduated to tenths. I have been detailed for engineer duty on Gen. [Halbert E.] Paine’s staff to take charge of the works of the 3rd Division & shall have to quarter at Div. headquarters &c, which will cost something I am afraid. I don’t know how I shall succeed nor how long I shall stay so as you need not say anything to nobody ’till I write again. Your brother, — J. B. Johnson, Co. G, 5th U.S.C.T.